Aaargh EASTER Crafts already?! I hear you exclaim? What? But Easter is aaaages away… yes yes, I know, but… the kids don’t really care that we made Easter Eggs Chicks already, they just had fun. If you want to make these, you have to start on some egg blowing (check out how on my How To Make Easter Eggs Post) and collecting of empty egg shells. These make great Easter Craft for Preschoolers beginning to learn how to handle precious egg shells! These Tissue Paper Chicks where first shared in Februrary 2012 and updated for your convenience! I saw some tissue paper wibbly wobbly eggs on 5 Orange Potatoes and really wanted to try the “Tissue paper” technique out! So Easter Eggs Chicks you have! We have made Easter Birds last year – but last year, I painted them first and Red Ted helped me decorate. 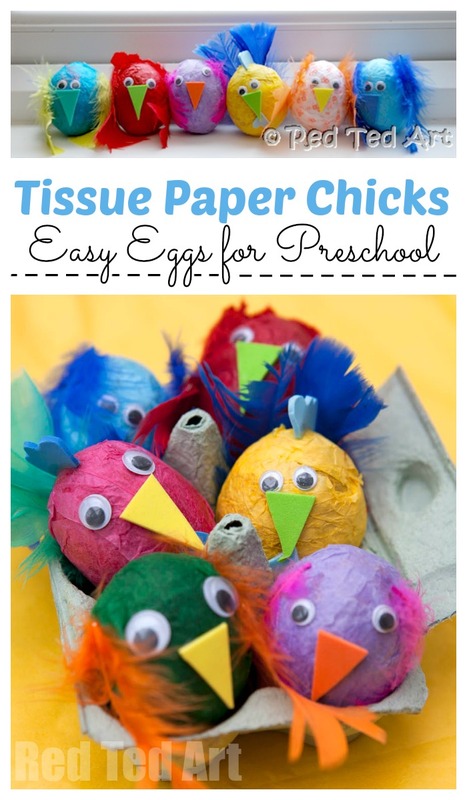 What I love about these tissue paper chicks, is that both children could join in MORE. Red Ted (4) managed it all himself AND they can now play with our rooster and birds, as they are not as fragile as your traditional decorated egg shells. Perfect. 1) Blow your eggsand make sure are fully dried. Cut your tissue paper into strips and squares. 2) Add glue to your strips of tissue paper and then wrap the paper around you egg. Add several layers. You can use a small brush if you don’t want sticky fingers! Pip Squeak actually broke one of the eggs whilst we were doing it (she decided it bang it on the table)… but with the tissue paper we just patched up the hole and used the egg anyway! You can see the tend, if you look for it, but I don’t think it matters! 3) Let your tissue paper chicks dry. Add your googly eyes, beaks, roosters combs and feathers. The children chose all the colours, which I adore. Easy peasy and cute as newly hatched chicks! Aren’t these Tissue Paper Chicks simply wonderful? I love that even YOUNG children can help make these!